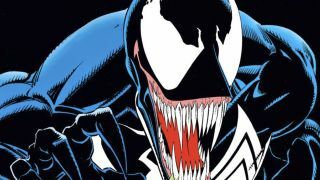 The Sony-produced Venom movie may adapt a 1993 mini-series called Venom: Lethal Protector, according to Omega Underground. The website noted that a production listing for Venom included San Francisco in its list of shooting locales, and that a casting call is searching for actors to play mercenaries. That might not sound like a lot, but both are key elements of the Lethal Protector arc. If you're not familiar, Lethal Protector begins with Eddie Brock and his living alien costume (together known as Venom) settling in San Francisco. Venom and his nemesis Spider-Man have agreed to stay out of each others' hair, so long as Venom doesn't cause a ruckus. Of course, Venom is off murdering people by the third page, but at least he's doing it in the name of justice. The titular anti-hero's antics earn him the ire of Orwell Taylor, the father of a prison guard Venom killed. He sends five mercenaries, each utilizing stolen Tony Stark technology, to kill Brock and his symbiote. They fail, but it leads to Brock getting captured by a different villain, who then uses the symbiote to create five of Venom's 'children'. Oh, and did I mention there are mole people living in a part of San Francisco that's been buried since the beginning of the 20th century? 'Cause that's a thing. Still, Lethal Protector (with some revisions) could fit perfectly for a solo Venom film. If Venom's out on the west coast while Spidey's web-slinging across the east coast, there's your explanation for why they haven't crossed paths. If the mercs use Stark technology, whether it's implied our outright stated, there's your connection to the MCU (remember that back in June, former Sony boss Amy Pascal said Venom and the MCU are connected, though it should be noted that MCU shotcaller Kevin Feige didn't seem to agree). And if Carnage is going to be the true villain of the movie, maybe his origin story will be retrofitted so that he takes the place of Venom's 'children' in Lethal Protector. If you're thinking of picking up your own copy ahead of the movie, just know that Lethal Protector is an incredibly '90s comic. Inexplicable pouches, impossible musculature, and over-written word bubbles as far as the eye can see. Brock sports a mullet. Bad guys wear broad-shouldered suits and slicked-back ponytails. It's overstuffed and way too much happens to make it all feel coherent. But as long as you know what you're in for, it's an excellent and entertaining trip down Nostalgia Lane, and it might provide you a sneak peek at the Venom movie.